Welcome to your home in the sky! 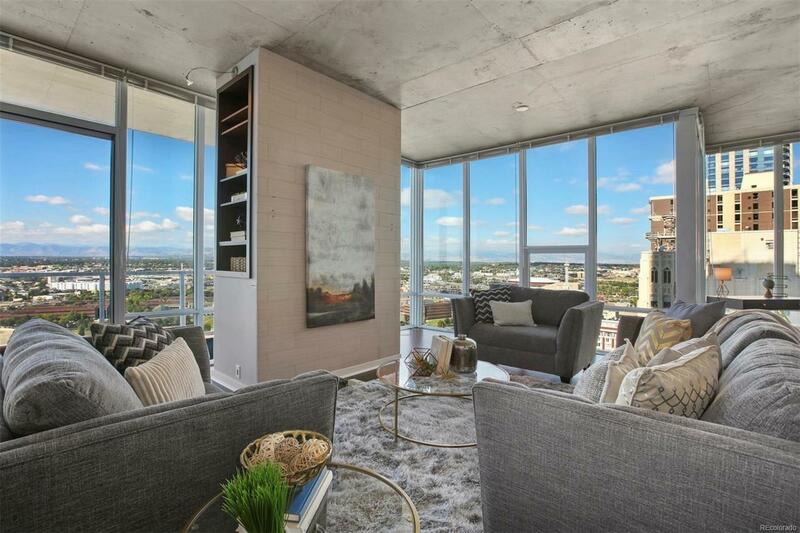 Enjoy unparalleled, unobstructed city and mountain views from every room of this stunning 2 bed, 2.5 baths, 1726 SqFt Spire unit. This home features numerous upgrades and custom touches, as well as an open layout ideal for entertaining. Pour drinks from the custom built in bar, and enjoy watching the sunset from your balcony. The custom media tower is pre-wired for surround sound, while the master bedroom can easily accommodate a king size bed, and still have room for a seating area to create a cozy retreat. The luxurious five piece master bath leads to the walk-in closet, and the second bedroom is roomy, with its own en-suite full bath. This corner unit enjoys no shared walls, plus the convenience of the included full size washer and dryer. Two parking spaces, 2 storage units, and all of Spire's amenities (pool, fitness center, dog park, 24/7 concierge, etc) make the ideal home located in the heart of downtown! See www.spire2301.com for more pics.